The Horse Racing season is back and it all began with the Cheltenham Festival, a highlight of the jump racing calendar. This year was made even more exciting for guests as Hospitality Finder's The Green Room made it's way to The Festival for the first time. The Green Room is synonymous with its famous faces from the world of sport and entertainment, and this year was no different with Sir AP McCoy at the helm. As our Cheltenham ambassador, AP was there to provide our guests with inside knowledge on The Festival and his tips for the day. In addition to AP The Green Room was host to ambassadors Lawrence Dallaglio and Mike Tindall, as well as current jockey Sam Twiston-Davies who joined the panel. The guests were joined by Rugby legend Johnathan Davies, Jamie Redknapp, Natalie Pinkham and Zara Tindall. We were back in The Green Room for day 2 of Cheltenham, guests were dressed in their finest for Ladies' Day, and as they arrived they were treated to a glass of Champagne. 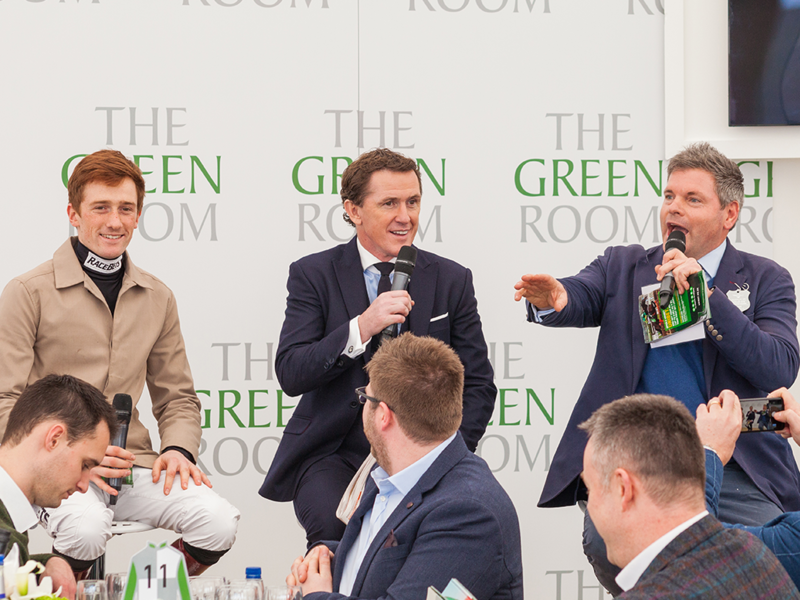 Once seated guests were treated to a four course silver service luncheon, whilst they were entertained by the days speakers, on the panel once again was Sir AP McCoy and Sam Twiston-Davies. The highlights of the days racing was the Queen Mother Champion Chase, won by favourite Altior who provided another victory for trainer Nicky Henderson. It had been a successful Festival for Henderson as he won the Champion Hurdle with Buveur D'Air. After this thrilling race guests were back in The Green Room for traditional afternoon tea and to take in more of the day's racing. There was a sea of green at The Festival on Thursday as St Patrick's fever hit Cheltenham. The JLT Novices' Chase was the first race of the day, and one of the most highly anticipated. The winner, Shattered Love, was ridden by 18-year-old Jack Kennedy and after a spectacular race, the mare gave Kennedy his third win of The Festival. It was also success for the trainer Gordon Elliot who won his fourth race of the week with the JLT Novices' Chase. She's a super mare and she's only been improving. She does everything so easily. With the final day of The Festival underway, it was back in The Green Room for Gold Cup day. Our guests were greeted with a drinks reception and the final chance to mingle with the celebs. Of course, AP McCoy was on hand to give guests his inside tips on some final bets for the week, he also gave his expertise on how the week had gone. One of the big races of the day was the famous Gold Cup Steeple Chase. Native River was the big winner here with trainer Colin Tizzard and ridden by Richard Johnson. The Green Room will return to the Cheltenham Festival next year, you can find out more here.